The internship lasts for a period of three until six months. During this period, the intern will work under company rules (DDTC) with the seniors’ guidance and earn above average daily allowance. Since the first day of my internship, I have seen that the commitment, importance and quality of work that DDTC asked from me are relevant. Honestly, before joining the DDTC-internship program, I lacked tax knowledge and the ability to analyze, and academic writing as well. But, it is now different. During my first month of internship, I did a lot different tasks and learned so many things. After I graduated from college, I believe that the academic provision alone is not enough to have a successful career in the future. The knowledge that I have gained in college is only a small part of the entire tax knowledge. I would say that I have been fortunate to have the luxurious opportunity to be an intern in internship program of DDTC. Internship at DDTC was where I began my real career as a Tax Consultant. Why did I say “real”? Because I think that being a tax consultant at DDTC really encouraged me to develop my knowledge which I only had a little of. Doing internship in DDTC is such a great blessing. It is not just about getting work, but FAMILY, KNOWLEDGE, and HAPPINESS. Before I joined DDTC, I did not know anything about Transfer Pricing. I obtained the KNOWLEDGE of Transfer Pricing here at DDTC. That KNOWLEDGE was given freely by the great FAMILY. By their patience, they taught me step by step until I understand what Transfer Pricing is and can do the work like they do. I have gained a lot of experience since I got a chance to be an intern DDTC. It has taught me not only to think beyond ordinary but also to have strong basic knowledge of taxation. DDTC also makes me realize that our success can be proven through what we create, so I don’t stop creating extraordinary work. Being an intern at DDTC is one of my precious moments in life. I lacked tax knowledge and ability to analyze, and academic writing as well. But, it is different now. During my first month of internship, I did a lot different tasks and learned so many things that I did not learn in college. Having been given the chance to do an internship in DDTC was a valuable thing for me. Being in the Transfer Pricing team has given me a lot of experience to learn things that I didn't get in my last three years in college. Being an intern in Tax Compliance & Litigation Services at DDTC is an invaluable experience, and I will leave this internship with a different view of tax and its culture. My internship made me feel like a true working professional in the real world. The experience also taught me to be more open to different ways of tax view and to just embrace the differences that exist in the tax world. Having the opportunity to take part in an internship with DDTC was something that changed my perception of what taxation is about. The opportunity to work with professionals in tax field gave me valuable knowledge and experience that I only had at DDTC. During my internship, I learned so many things about tax, like how to provide good tax advisory for clients, prepare documents for tax court, make written explanation and closing statement for lawsuit and tax appeal. During my internship at DDTC, I felt like I was working at a place where the atmosphere feels like home because all of the hospitality from my colleagues I received there. They also taught me a lot of new things I didn’t know before. It has been 1 month since I worked as an intern in compliance and litigation division and I have gained a lot of knowledge from all of my colleagues. Internship in DDTC has been an adventure and valuable experience for me. I can say that this is one of the turning points in my life. To see what it's like to be in the tax professionals' world and to work under the same roof with the best in this field has made me set my mind to choose taxation as my future career field. Having undergone internship at DDTC has broadened my perspective and enriched my knowledge in taxation, especially in transfer pricing. During my internship, I was given some tasks related to transfer pricing cases. The assignments given were mostly new things for me because my university doesn’t have any transfer pricing-related class. The best thing that you can do when you join the internship program at DDTC, is study. Having an internship at DDTC means gaining a lot of first-hand experience as well as knowledge regarding tax consulting. Over the past two and half months I have learnt so much, from making tax advisory to preparing documents for tax court. Knowledge can be easy to gain here, by paying a visit in library which has comprehensive tax book collection or by asking the experts. For 2 months I joined DDTC under the internship program that they held. 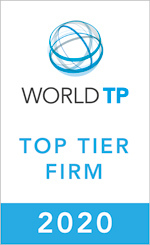 I joined transfer pricing service division and it was a blast. I am really grateful to be an intern in DDTC. Two and half months at DDTC has taught me many things about tax and life. This opportunity to work together with Indonesian Tax Expert like Mr. Darussalam, Mr. Danny, Mrs. Nazly Siregar, and many more at DDTC has shaped my perception on taxation in Indonesia. DDTC provides exciting internship opportunities for highly motivated and enthusiastic university students or fresh graduates with tax, economic, or accounting background, if you are keen to learn about tax consultancy work and have strong personal integrity. Working as an intern at DDTC was beyond amazing. During my three months here, I learnt many things I hadn’t known before. Here, I got a chance to feel how it was like to be a tax news contributor. Even though I was just an intern, DDTC trusted my work and uploaded all the news I’d written. Knowing that there are a lot people out there reading your news and at the same time you enrich their knowledge is one of the best feelings in the world. It was an honor to have an internship at DDTC. In three months, I gained a lot of experience in taxation, especially from Tax Compliance and Litigation division. Having an internship program in DDTC for 3 months was one of the most interesting experiences I have done so far. I learnt many things that I had never learnt in the university. I learnt many things in Tax Compliance and Litigation Division. The job that was given to me was so practical. I was treated the same as the staff here. Now, I know how a tax consultant really works. I worked as an intern at DDTC for 3 months. As a part of the transfer pricing service division and having gained a lot of experience, I had a great time working here. Not only do I know what transfer pricing is and how to prepare transfer pricing documentation, I also learned a lot about tax, both global and domestic. Having an opportunity as intern at DDTC is the most amazing work experience in my life. Knowing that DDTC is the only one research and knowledge based taxation firm gives me a pride to be able to contribute into it. DDTC has the best office environment I ever felt. All of divisions work together as a family and always sharing knowledge each other. DDTC treats their clients professionally and beyond expectation. 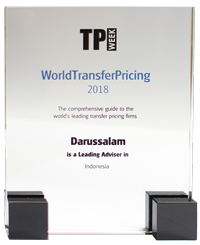 It is an honour for me to have worked at DDTC as a Transfer Pricing intern for a month. Despite the short duration, this experience means a lot for me. This was my first internship program. And it was definitely beyond my expectation. All of DDTC’s staff is helpful and humble. Having the opportunity to intern at DDTC at Tax Compliance and Litigation Division was a valuable experience for me. For approximately 4 months of internship here, I learnt myriads of things I can never attain at university to complete the tasks given. Interning at DDTC was a valuable and rewarding experience. The atmosphere is warm, friendly, and relaxed, which only exists amongst people who are truly professionals. The chance to see how professional tax consultants work was a privilege for me. Not only did the internship give me the opportunity to learn more about taxation, bu also valuable work experience whilst complementing my academic interest. Interns were trusted as members of the team and my seniors were helpful and welcoming. I had a great experience as a Transfer Pricing Team Intern in March 2017. As DDTC is a company providing professional tax services , I felt that the internship at DDTC was a great platform for me to gain deeper insight the tax, particularly transfer pricing. 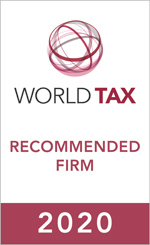 My job scope included the handling of transfer pricing documentation in various industries. It was really a great honour for me to join DDTC as an intern in Transfer Pricing Division starting from March 13th to April 28th 2017. During the internship at TP, I was assigned to perform industrial analysis on various industries, such as automotive industry, heavy equipment industry, mining industry, pulp and paper industry, stationery industry, and etc. Allow me to introduce myself, my name is Brian Pradana, an alumni from Sebelas Maret University Surakarta, majoring in accounting. I was an intern at DDTC at Transfer Pricing division. I gained lots of experience from DDTC, through the assignments and guidance from my seniors who are experts in their fields. I'm able to comprehend the preparation process of transfer pricing document. My internship experience at DDTC was valuable in that I gained skills, knowledge, and experience like never before. Moreover, the knowledge in transfer pricing, where the knowledge of transfer pricing itself is one which is not easy to obtain whether in academic environment such as the campus or other places. The working environment at DDTC is extremely conducive, supportive, and full with a sense of kinship. This helped me finish every assignment I got. interns like me to truly experience life as a tax consultant. It was both a great experienceand great pride for me when I got the chance to undergo a 3-month internship program at DANNY DARUSSALAM TAX CENTER (DDTC). After going through several stages of selection including Written Exam, TOEFL and interview, I was finally selected to be one of the interns of many applicants. I was given the opportunity that was not something everyone can get. I competed with so many friends out there to be accepted as an apprentice at DDTC. Hello, my name is Willa Maharani, a student majoring in Accounting at the University of Indonesia. I am currently undergoing an internship program in tax compliance and litigation division for approximately 3 months. The experience I attained during my internship here came in the form of learning I might not obtain in university. Once again I would like to thank Mr. Darussalam and Mr. Danny for giving me this opportunity. May DDTC continue to succeed. A decade of impacting the Indonesian tax system is much more than a mere slogan, this sentence depicts Danny Darussalam Tax Center (DDTC)’s 10 years of colouring the world of taxation Indonesia as a taxation knowledge research and knowledge based institution with international standards, tax activities as well as a leading and renowned source of tax information under the leadership of Darussalam, SE., Ak., CA., M.Si., LL.M Int Tax and Danny Septriadi, SE., M.Si., LL.M Int Tax. Allow me to introduce myself, I am Nicko Valensky, a student of Fiscal Administration Science class of 2014. I got the opportunity to intern at DDTC in the transfer pricing division for 3 months from June to August 2017. It is an honor and pride to be able to intern at DDTC, considering DDTC is one of the best tax consultants in Indonesia. My name is Zulfaa Ira Malliha from the University of Indonesia, majoring in Accounting. I joined the Internship program that lasted for a month and a half at Compliance and Litigation division. I am Angga Fahmi Dirga, a student of the University of Indonesia, majoring in Accounting. I interned at DDTC for 1.5 months. 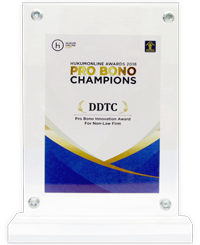 For me, the internship at DDTC’s Compliance and Litigation Division is a valuable experience. During my internship, I learned about the world of tax consulting, especially in terms of Compliance and Litigation, as through the internship, DDTC gave me the opportunity to complete serious assignments related to Compliance and Litigation. Hello, my name is Amanda, a student majoring in Accounting at the University of Indonesia. I was given the opportunity to undergo an internship program in the Compliance and Litigation division from July to August 2018. During my internship program at DDTC, I was enlightened by new knowledge about how tax consultants work as professionals, in particular when facing audits, objections and appeals. The internship at DDTC granted me immeasurable new knowledge and experience, which I did not obtain in university. I was able to apply my knowledge in the field. The mentors and employees are exceedingly humble, competent in their fields, amiable, and willing to provide guidance in light of the assignments. The strong kinship enables us to study well. I sincerely hope that DDTC will become the best Tax Consultant in Indonesia and internationally. May DDTC continue to prosper! Hello, my name is Kalana Bayu Suta from STIAMI Institute of Social and Management Sciences, majoring in Public Administration Sciences concentrating in Taxation Administration. Interning in the special division for about one and a half months, I had the chance to study all tax-related matters from professionals and see how professionals work. Undoubtedly, DDTC encourages its employees to accumulate knowledge to ensure that they will stay competent and achieve more. Thank you DDTC for giving me the opportunity to be part of DDTC’s family. I hope DDTC continues to be one of the best tax firms in Indonesia and even in the world. Hello, my name is Kahfi from Indonesia Jentera School of Law. I underwent a 3-month intership at DDTC’s Tax Research and Training Services division. This internship has a profound effect on me in terms of the new experience and the knowlege in the field of taxation. I strongly support DDTC’s mission and vision, that is eliminating tax information asymmetry in Indonesia. I sincerely hope that DDTC continues to be a leading tax consultant in Indonesia and in the world. Hello, my name is Lovina from Indonesia Jentera School of Law. I interned at DDTC for 3 months from mid-September to mid-December. I am grateful for the internship opportunity as I was able to acquire transfer-pricing related knowledge and how to draft and file tax objections. I hope that DDTC continues to flourish and do its utmost for Indonesia.